Innovations in project delivery and construction methods can result in major-league savings for a transportation agency, according to results from projects built with the help of the Highways for LIFE initiative. While the first cost of an innovation usually exceeds the first cost of the traditional way, those costs are virtually always offset by savings in highway user costs and safety, Jagannath Mallela, principal engineer for Applied Research Associates, told Highways for LIFE workshop participants at the Transportation Research Board Annual Meeting in Washington, D.C. He noted that the fi rst costs of innovations drop over time as they become standard practice and the risk of deploying them is reduced. Mallela said he agrees with King Gee, associate administrator of the Federal Highway Administration, who said agencies are changing their mindsets from a public works mentality, in which the goal is to finish as many projects as possible, to a public service mentality. Serving the public means construction forces need to "get in, get out, and stay out," as the industry saying goes. Indeed, the goal of the Highways for LIFE program is not only to use innovations to complete projects in half the time it takes by traditional means, but to build them better and at lower cost. At the TRB meeting, Mallela presented an example from an Iowa interchange project. 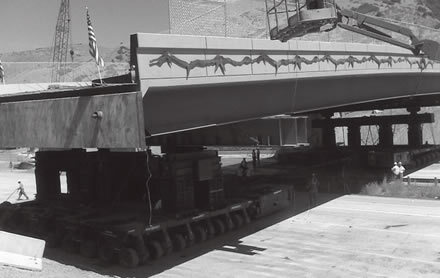 The major innovations were prefabricated bridge components in the form of full-depth precast deck panels. As well, the agency employed cost-plus-time (A+B) bidding to shorten the duration of construction congestion. The idea is to add up costs for both the baseline (traditional) and as-built (innovative) cases. The total construction cost of the baseline case was $11,128,864. And the total construction cost of the as-built (A+B) method was $12,738,756—$1.6 million more. Most of the cost increase resulted from prefabricated bridge components. But then you add up, for both the traditional and innovative methods, the highway user costs in delays and damages to life and property from crashes. The Iowa DOT estimated 607 vehicle-hours of delay while the traffic management plan was in place. Other costs were pegged at $8 per hour per private vehicle and $24 per hour for commercial trucks. It was estimated that private vehicles represent 86 percent of daily traffic and that commercial vehicles make up 14 percent. Innovations such as full-depth precast deck panels helped the Iowa DOT save time and money on an interchange project. Furthermore, the total time savings from the innovations were 251 days. Factoring in all delay costs over 251 days saved adds up to a benefit of $1,560,135 in favor of the innovations. Now you add up the safety costs for each alternative. The affected area was 6.8 lane miles. Crash rates are figured by dividing the number of historical crashes by the number of 100 million vehicle-miles traveled over the project length. The personal injury crash rate is 0.069 and the nonpersonal injury crash rate is 0.146. Applying unit costs found in literature for different types of crashes, the total safety benefit of using the innovations is $834,329. When you add the delay and safety benefits and subtract the extra costs of the innovations, the total savings come to $785,000, or 6.2 percent of the project's costs. In Utah, a Highways for LIFE innovation has sprung to life in the form of a new delivery method—construction management-general contracting, or CMGC. It calls for the highway agency to make separate contracts with the contractor and the designer, and to form a project team of the agency, design firm and contractor. The Utah Department of Transportation uses a two-phase contract with the general contractor. Phase one is a construction management consulting contract to help with the design. Phase two is the contract to build the project. Unlike design-build, the agency is involved in decision-making with both the designer and the contractor. Like design-build, the design and construction phases can overlap, leading to faster completion times. "We have referred to CMGC as design-build on steroids," said TRB workshop presenter Jim McMinimee, retired from the Utah DOT as director of project development and chief engineer and now a principal engineer with Applied Research Associates. "CMGC is fast, but it is also cheap." With CMGC, the agency makes decisions about who owns the risk and writes specifications to allocate it. The designer and contractor can talk about the risk and try to reduce it. For example, if a contractor submits a high bid for an excavation, the reason might be that the geotechnical information is insufficient to tell how much rock has to be blasted and ripped. So the contractor bids higher to cover the risk of the possible extra cost. But if the agency, designer and contractor can discuss the risk early on in the project, the agency can decide to obtain additional geotechnical exploration information—and reduce the risk. This leads to lower project costs. The process can be repeated on many bid items and significantly reduce the risks on a project. "At UDOT, we completed 18 CMGC projects and our pricing information suggested that our theory was correct," said McMinimee. "We did get better bid prices on CMGC as compared to average unit bid prices with design-bid-build." The largest CMGC project the Utah DOT has completed is an Interstate 80 widening job. The project included 14 bridges and used self-propelled modular transporters, or SPMTs, to move bridges into place quickly. The project was finished a full construction season earlier than original projections and resulted in user savings of $25 million on a $140 million project. Part of the time savings came from using the CMGC delivery method and part from using accelerated bridge construction techniques such as SPMTs, said McMinimee. The Utah DOT does not use CMGC on all projects. It still uses design-bid-build for simple projects like asphalt overlays and considers design-build a good tool for many other projects. But CMGC works well in urban environments, where there are many stakeholders. And it works well to introduce new technologies, like SPMTs. Self-propelled modular transporters moved an interstate bridge into place on a Utah project in just a weekend. The Utah DOT did not require SPMTs on the Interstate 80 project, but contractor selection was based on best value as well as price, said McMinimee. "We gave them points in the RFP based on speedy construction. One of the reasons that Ralph Wadsworth Construction got the job was that they proposed the fastest schedule, and SPMTs and CMGC were part of their proposal," he said. According to TRB workshop presenters, Highways for LIFE demonstration projects are showing that using innovations requires change and change involves risk. But with improved communications and better information—through means such as CMGC—risk can be mitigated. When that happens, costs go down and innovations pay major dividends. For more information on how innovation use saved time and money on Highways for LIFE projects, see the project summaries at https://www.fhwa.dot.gov/hfl/projects. A key goal of the Highways for LIFE initiative to mainstream innovation use is satisfying motorists' desires for a good driving experience. Surveys of projects completed so far under the initiative show that using innovation to build projects faster, more safely and with higher quality does improve user satisfaction. "What we're seeing on Highways for LIFE projects is that when highway agencies focus on the expressed needs and wants of highway users, their projects are more likely to be successful," said Kathleen Bergeron, Highways for LIFE marketing communications coordinator, at a Transportation Research Board Annual Meeting workshop on the Federal Highway Administration initiative. Increase safety for motorists and workers. Accelerate construction and minimize delays. The user satisfaction goal is designed to assess how satisfied users are with the completed project compared to its previous condition, as well as with the approach the highway agency used to minimize disruption during construction. The Highways for LIFE goal is a measurement of 4-plus on a 7-point Likert scale, a scale widely used in survey research. For the Highways for LIFE projects completed so far, states have used a variety of approaches to improve user satisfaction by reducing traffic disruption, getting the job done faster and enhancing quality. Among the accelerated construction techniques states have used are alternative project delivery methods, prefabricated materials, performance contracting, and incentive and disincentive clauses in contracts. To get the public involved, many highway agencies have created comprehensive communication plans that include tactics such as stakeholder meetings, open houses and outreach to business owners and local officials to explain the techniques and technologies they plan to use on the project and get input. Many outreach plans include feeding a steady stream of information on the project's progress to stakeholders through media outreach, websites, telephone hotlines, highway advisory radio, portable message signs at the project site, newsletters and direct mail. Survey results show that these efforts are paying off. The Utah Department of Transportation, for example, minimized traffic disruption on a Highways for LIFE project to replace a Salt Lake City bridge by using accelerated bridge construction techniques. The approach involved removing the old bridge and replacing it with a new superstructure in one weekend using self-propelled modular transporters. According to a post-construction survey, more than 94 percent of respondents were satisfied or very satisfied with the results of the Utah project, a Likert scale measurement of 6.7. Nearly 92 percent were satisfied or very satisfied with the overall performance of the highway agency and its contractor during the project, a Likert scale measurement of 6.6. The Oregon DOT used prefabricated bridge elements made with high-performance concrete to replace five bridges on Oregon 38. The agency accelerated construction by building the new bridges next to the existing structures and sliding them into place overnight on a rail system. It also used a public involvement program that focused on schools, civic organizations and businesses to build support for the project and keep it moving forward smoothly. An after-the-fact survey found that 96 percent of respondents were somewhat to very satisfied with the project approach, while 95 percent were satisfied with the final product. The Minnesota DOT used a full road closure to rebuild part of a major road and busy interstate interchange in North St. Paul. A survey conducted afterwards found that 90 percent of residents and 83 percent of businesses had a positive overall opinion of the project. Pre- and post-surveys showed that two of five respondents changed their opinion on the full road closure approach from negative to positive. The Georgia DOT's project to build a new interchange on Interstate 85 used a design-build approach with prefabricated bridge elements to speed construction and cut construction-related traffic congestion. The agency set a goal of 80 percent user satisfaction and conducted surveys at the quarter points of project completion. The first survey showed that just 65 percent of users were somewhat to very satisfied with the project, while 35 percent were somewhat to very dissatisfied. The survey also found that respondents who had received information on the project were more satisfied. The agency stepped up its communication activities, including updating messages on the project hotline, mailing postcards to residents on upcoming lane closures and construction work, installing portable message boards in the project area and distributing a news release. 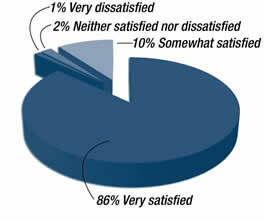 The final survey determined that user satisfaction had increased to 91 percent. For more information on user satisfaction survey results in Highways for LIFE projects, see the project summaries at https://www.fhwa.dot.gov/hfl/projects. The Oregon DOT combined prefabricated bridge construction with comprehensive public outreach to speed the replacement of five bridges. Self-adjusting temporary traffi c signals were among the innovations the contractor used to reduce motorist delay on the Michigan project. Using performance contracting for construction enabled the Michigan Department of Transportation to enhance safety and quality, speed construction, minimize motorist delay and lower life-cycle costs while rebuilding a two-lane rural road. Performance contracting is an innovative technique in which the contractor is responsible for achieving defined goals and proposing how it will achieve those goals. The contractor is awarded incentives or assessed penalties based on its performance on the goals. Because of the Michigan DOT's positive experience with the technique, it plans to use it on future projects, according to Michigan Demonstration Project: Performance Contracting for Construction on M-115 in Clare County, a Federal Highway Administration report on the project. The M-115 project, built with the help of a Highways for LIFE grant, reconstructed a 5.5-mile (8.9-kilometer) stretch of deteriorated roadway with two small bridges that serves as a primary connector for weekend travelers from Detroit to northwest Michigan. The Michigan DOT awarded the contract on the basis of best value considering goals and price rather than lowest cost. The contractor used a number of innovations to help it meet the project goals, which were based on performance goals recommended for projects that receive Highways for LIFE funding. As a result, the contractor earned the maximum incentives for achieving goals for date open to traffic, construction and cleanup completion, pavement performance and work zone safety. The contractor also earned the incentive for minimizing motorist delay, but missed the bonus payment because one measurement was longer than 15 minutes. All told, the contractor received $340,100 in incentive payments, about 7 percent of the bid price. No workers were injured while the project was under construction, so the contractor exceeded the Highways for LIFE goal for worker safety. Two motorist crashes involving deer were reported during the 3.5-month construction period, lower than the Michigan DOT's goal of less than one crash a month, excluding animal crashes, during construction. To meet the goal of no more than a 10-minute delay beyond normal travel time, the contractor used several innovations, including precast bridge construction, self-adjusting temporary signals to control single-lane traffic during bridge construction, 24-hour roadside patrols to minimize delays from vehicle breakdowns, and temporary traffic lanes to provide two-way traffic during major construction stages. As a result, the average delay was just 2 minutes and 16 seconds. 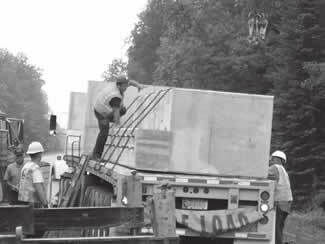 Using precast bridge elements saved time on the rehabilitation of two small bridges on the Michigan route. 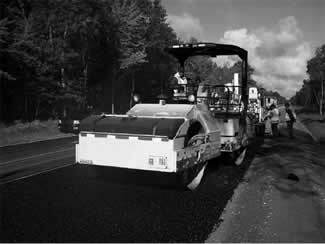 Quality measurements for pavement noise and smoothness showed substantial improvement after construction. The average tire-pavement noise level was 95.2 A-weighted decibels, down 4.2 dB(A) from the preconstruction level. Pavement smoothness was an average International Roughness Index measurement of 37.8 inches per mile, a dramatic drop from an IRI of 115.5 inches per mile beforehand. Surveys showed that the project improved the driving experience for road users. A preconstruction survey found that 100 percent of respondents were somewhat to totally dissatisfied with the pavement condition and ride quality of the roadway. But after construction, 81 percent of survey respondents were somewhat to very satisfied with the pavement condition and ride quality. The contractor used an asphalt-stabilized crack relief layer to help meet the five-year pavement warranty requirement. It cost the Michigan DOT $690,226 more to build the project than it would have with a more traditional delivery approach. But the higher initial costs were more than offset by lower life-cycle costs, an analysis showed. A requirement to provide a five-year pavement warranty and the flexibility offered by performance contracting resulted in the contractor opting to mill the existing hot-mix asphalt overlays, rubblize the underlying concrete pavement, and place an asphalt-stabilized crack relief layer under the overlays. Because of those innovations, the pavement is expected to perform better and last longer. In fact, the life-cycle cost analysis showed that over a 20-year period, the project as built will save more than $1.6 million in net present value terms over the cost of a conventionally built roadway. Additional safety features such as rumble strips that provide an audible warning when vehicles leave the roadway are expected to reduce crashes, making this innovative contracting approach even more significant over the long term. To view the report, go to the "Project Summaries" section at https://www.fhwa.dot.gov/hfl/projects. Precast concrete pavement systems, a Highways for LIFE Vanguard Technology, has been named one of the top trends for 2010 by Better Roads magazine. These precast modular concrete panels, formed off-site and installed during off-peak travel times, reduce traffic congestion and enhance safety on projects and have the potential to produce higher-quality pavements. In "Road Science: Top 5 Trends of 2010" (http://www.equipmentworld.com/road-science-top-5-trends-of-2010/), the magazine cites work by the American Association of State Highway and Transportation Officials' Technology Information Group to accelerate adoption of the technology. Highways for LIFE is also promoting precast concrete pavement systems through a combination of demonstration construction projects and Web conferences that show how states are applying the technology to make quick and invisible repairs in high-traffic areas. So far, at least nine states—California, Delaware, Florida, Missouri, New Jersey, New York, Pennsylvania, Texas. and Virginia—have used or are planning to use precast concrete pavement systems. 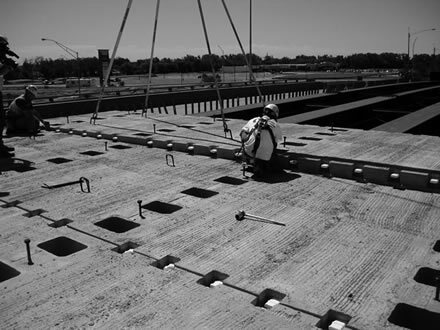 To access AASHTO TIG resources on precast concrete pavement systems, including sample specifications and product information, visit http://tig.transportation.org/?siteid=57&pageid=1826. To view a Highways for LIFE Web conference on precast concrete pavement systems, go to www.nhi.fhwa.dot.gov/about/innovationseries.aspx. For more information, contact Timothy LaCoss, leader of the AASHTO TIG Precast Concrete Paving Slabs Team, at (518) 431-4125 or timothy.lacoss@dot.gov. The Highways for LIFE website has been revamped with beefed-up content and an easier-to-navigate design. 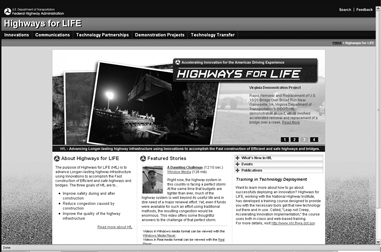 The new Highways for LIFE website features streamlined navigation and updated content. The site, at www.fhwa.dot.gov/hfl, is a one-stop shop for information on the Highways for LIFE initiative to accelerate widespread use of innovation in the highway community. The site's streamlined new home page features the program's latest developments and upcoming events, as well as links to success stories and information on innovations that speed construction, reduce congestion, and enhance safety and quality. "We want to offer site users more resources that help them do their jobs better, such as information on the range of innovations available and how states are using them to improve project outcomes," said Kathleen Bergeron, Highways for LIFE marketing communications coordinator. One-click access from the home page to information on innovations, communications resources, technology partnerships with industry, demonstration construction projects with states and technology transfer tools. Information on resources for learning about innovation use, including the "Innovations" Web conference series and the "Leap Not Creep: Accelerating Innovation Implementation" workshop on technology deployment. "Inno-bits," brief, nontechnical descriptions of innovations in technology and management concepts. "A Daunting Challenge," a short video on the challenges the highway community faces and how Highways for LIFE is helping address them. Reports on the results of innovation use on demonstration projects and efforts to turn innovative prototypes into market-ready products. Articles and videos from FHWA and industry on the latest innovation developments. "Through the Highways for LIFE program, we've created a treasure trove of information and resources on innovation," said Bergeron. "Our goal with the website redesign was to make that information easier for users to access and use." For more information or to provide feedback on the site redesign, contact Julie Zirlin at (202) 366-9105 or Julie.Zirlin@dot.gov.